Fiction – hardcover; Bloomsbury; 384 pages; 2012. Review copy courtesy of the publisher. Suzanne Joinson’s debut novel, A Lady Cyclist’s Guide to Kashgar, is a fascinating account of a trio of English missionaries working in a Muslim-dominated region of China in 1923. It also features a dual narrative, set in present day London, in which a young woman learns she has inherited an apartment full of belongings, including a pet owl, from a stranger. The missionary side of the story unfolds in a series of diary entries by Evagaline English, who is penning a lady cyclist’s guide to Kashgar, hence the title of the book. Eva, as she is known, is in Kashgar, East Turkestan, with her sister, Lizzie, and their benefactress, Millicent, to help set up a Christian mission on behalf of the Missionary Order of the Steadfast Face. The book opens in dramatic fashion when the trio, somewhere in the desert, stumble upon a woman giving birth by the roadside. They stop to help, and Millicent delivers the baby using a pair of forceps. The mother dies, presumably from blood loss, and a crowd of onlookers blame Millicent for her death. ‘They say we have taken the girl to give ourselves strength, and that we plan to steal the baby and eat it.’ Lizzie spoke quickly, in that odd, high voice. Her ability with this impenetrable Turki language is much better than mine. ‘She died in childbirth, natural causes, as you can all very well see,’ Millicent shouted uselessly in English, and then repeated it in Turki. Lizzie set about bringing water in our tankards and a blanket. From thereon in, the three women tread a dangerous path. Not only are they in a Muslim-dominated area of China — where other religions are not tolerated — they now have a baby who does not belong to them in their possession and are being charged with murder and witchcraft. While under a kind of “house arrest” the baby’s welfare falls largely to Eva. Meanwhile militant-like Millicent is hellbent on converting the locals and dreamy Lizzie spends her days taking photographs. The narrative charts the tensions between the trio and the local community as it rises from resistance to calamity. More interestingly, it also charts the tensions between the three women, each of whom has a secret to keep. The present-day narrative, which is told in the third person, follows Frieda, a woman who lives alone in a South London apartment. Frieda has a busy job that involves lots of travel; she’s estranged from her mother; and has been involved in a long-term affair with a married man that is unravelling at the seams. Then two startling things happen to her, which turn her life upside down: she finds a homeless Yemeni man living on her doorstep and befriends him; and then she receives a letter informing her that she has inherited a council flat full of property, including a caged owl, belonging to a woman she doesn’t know. According to council records, the woman is Frieda’s next-of-kin. As you can tell, these two narratives are poles apart, but part of the mystery and enjoyment of reading A Lady Cyclist’s Guide to Kashgar is trying to determine the link between them — and it’s not as obvious as one might think. Joinson writes each thread in a different prose style — the first has an old-fashioned feel and is reminiscent of the period in which it is set, the second is more contemporary in tone and style. And while some readers might find this juxtaposition jarring, I quite enjoyed moving backwards and forwards in time like this, although I much preferred the missionary storyline, probably because Eva’s voice was so engaging. I also enjoyed the judicious use of cliffhangers, which keeps the momentum going. As I read this book I felt that I was going on a rather intimate journey, because Joinson captures periods and settings so vividly that exotic places, such as Kashgar, come alive on paper. Her attention to detail — especially in terms of historical facts and cultural references — pay off without you ever feeling as if she’s shoehorned in a bunch of research just to get the “flavour” right. 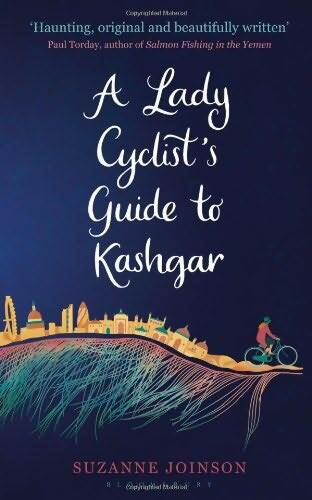 And while the title is somewhat of a misnomer (there’s not much cycling in this book at all), A Lady Cyclist’s Guide to Kashgar is a gorgeous read, tempered by a lovely sense of wry humour, that whisks you away to another world. It’s peopled by a cast of unforgettable characters and covers their journeys — physical, emotional and metaphorical — with care and compassion. It’s a perfect rainy day read. I have this in the TBR Kim and it is one that I have held off reading because of the ‘inherited house’ aspect. It probably sounds a bit bolshy of me, and it sounds like it is done well in this book, but that has become a bit of a jaded cliche for me in books. As I said though have it in the TBR so I am sure it will be read at some point.